The web defines nanotechnology as any technology related to features of nanometer scale: thin films, fine particles, chemical synthesis, advanced microlithography, and so forth. Nanotechnology is therefore more of a 'catch-all' description of activities at the level of atoms and molecules that have applications in the real world. Although nanotechnology is in the media frequently as a new technology, research in the field has actually been ongoing for many years. In the last 30 years over a dozen Nobel prizes have been awarded in nanotechnology, including the development of the scanning probe microscope (SPM), and the discovery of fullerenes. 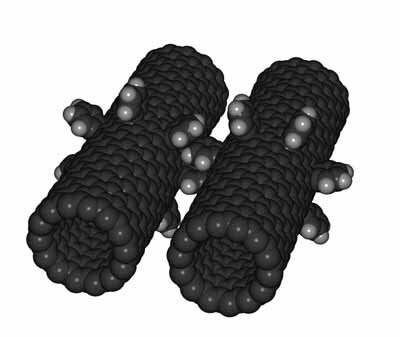 It was perhaps the discovery and potential applications of the fullerene molecule (also called a buckyball) and a related structure, the buckytube (or nanotube), that has sparked the current interest in the field. What are fullerenes and nanotubes? These are both compounds that are composed of carbon atoms. An example of a fullerene molecule (shown below) is composed is composed of 60 carbon atoms. To view and manipulate this molecular model in 3-D --go to the: The java applet -How Big --or small -- is a Buckyball? To view and manipulate this molecular model in 3-D click here. Carbon nanotubes (CNTs) have caught the imagination of scientists for everything from superconductors to transistors and diodes, material strengtheners, ion storage for batteries and more. One of the most promising applications is a thin panel called a field emitter display (FED). Both Motorola and DuPont are presently investigating this application. More recently LSI Logic has joined up with Nantero a Massachesetts-based startup company. LSI is providing manufacturing research and development for a that is creating a new kind of computer memory using carbon nanotubes. LSI sees a product possibly as early as 2006.For each bit of memory, multiple nanotubes are suspended above a metal electrode and charged. Depending on the charge, the flexible nanotube can bend upward, away from the electrode, or downward, into contact with the electrode. The resulting signals form the building blocks of a digital device. "The best thing is, these switches are working," Norm Armour from LSI said. "We built some test devices, and we fired them up the other day, and they worked." The nanotube-based memory can act like "flash" memory, a reprogrammable type of memory that can retain data even when power is switched off. Fullerenes (C60) are being investigated for their potential use as a drug-delivery system for cancer, AIDS and other diseases. A long term objective of nanotechnology is to build nano-sized machines which can be inserted into the human body in order to detect and repair diseased cells is a real possibility. Current research however, is only at the primitive levels designing simple components e.g., a carbon nanotube based gears (below) For more details see 11th Foresight Conference on Molecular Nanotechnology). Carbon nanotube based gears. For further information, see the papers"Molecular Dynamics Simulations of Carbon Nanotube Based Gears" by Jie Han and Al Globus, MRJ, Inc., Richard Jaffe, NASA, and Glenn Deardorff, Sterling Software, NASA Ames Research Center. According to CMP Científica, a European nanotechnology information company, over 600 companies are currently active in nanotechnology, from small venture capital backed start-ups to some of the world's largest corporations such as IBM and Samsung. Governments and corporations worldwide have invested over $4 billion into nanotechnology during the past year. In addition many universities around the world have a nanotechnology department which being a truly multidisciplinary field draws on scientists from physics, chemistry, biology material science, electronics and medicine. 4-11th Foresight Conference on Molecular Nanotechnology).